The golf course: The 18 hole golf course, par 71, designed by Dave Thomas has extensive, undulating greens and strategically placed bunkers which provide entertainment and excitement at every turn, with pleasant surprises awaiting the golfer at every hole. Since the official opening day, this golf course has hosted several tournaments, strengthening its position as one of the favorites for professionals and amateurs alike and has also received wide news coverage by the most important regional and national mass media. Apartment rentals: Escape from the city and come to Lorca Resort, tourist apartments with all amenities in an idyllic setting from which you can enjoy an overnight stay or long time rental, next to the natural park Sierra de Almenara, 10 minutes from the city of Lorca and 10 minutes from the beaches of Águilas. 2 bedroom, 2 bathroom fully equipped apartments with living room and kitchen right next to the golf course with free garage, pool and green areas, air conditioning and large terraces with wonderful views of the golf course or the Sierra. 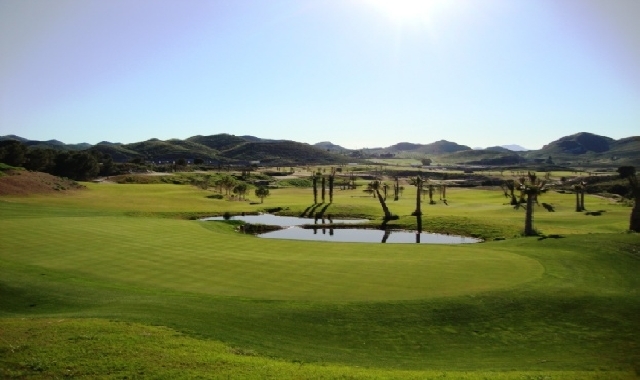 Resort with restaurant, bar, mini market, security 24h, golf course with putting and chipping green, driving range etc.